Attend the town hall on Monday, June 23, 2014! The Federal Conservative Government is cutting $36 billion from Canada’s public health care system. 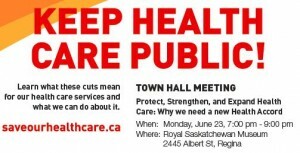 How will the loss of $1.1 billion to Saskatchewan’s share of health care funding impact you? Learn more and what you can do about it! 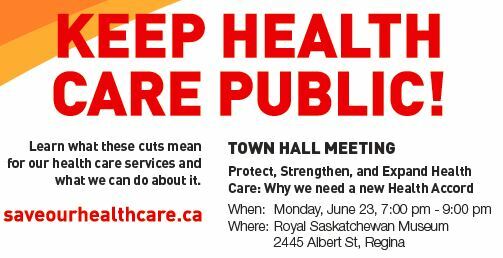 Attend the Save Public Health Care Town Hall Meeting featuring: Maude Barlow, Chair of the Council of Canadians; Paul Moist, CUPE National President; and Ryan Meili, Canadian Doctors for Medicare.